Veterinarians are super heroes. And they are also three times more likely to die by suicide than the rest of us. 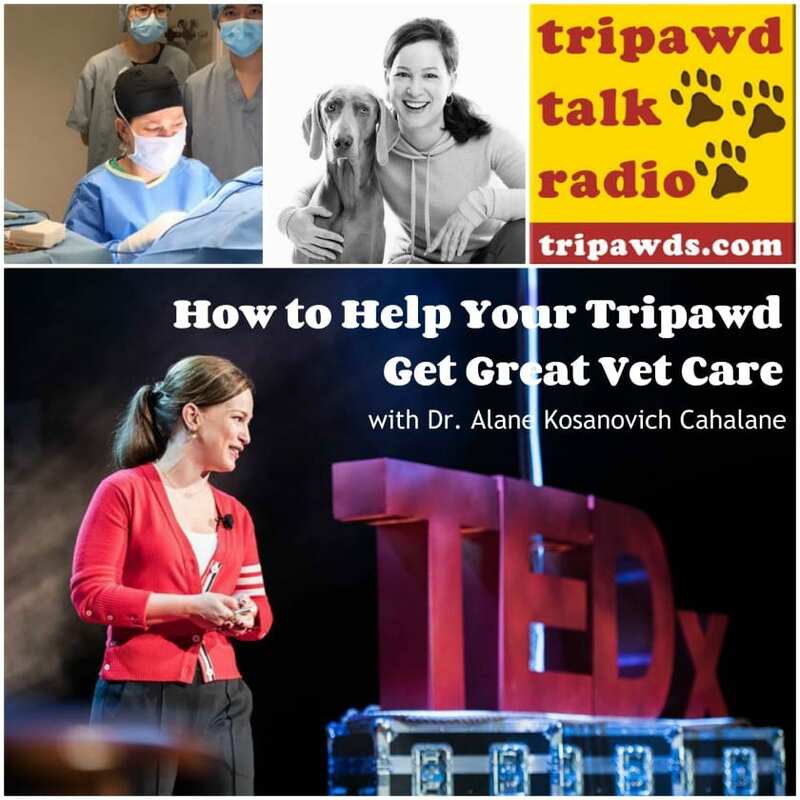 In our second Tripawd Talk Radio interview with Hong Kong veterinary surgeon Dr. Alane Kosanovich Cahalane, we explore why vets are at risk, and we learn how we can help our Tripawds get great vet care through trust and communication. #NotOneMoreVet: Building Trust With Our Vets Helps Tripawds Get Great Vet Care. It’s a Win, Win! Many factors influence the higher rate of suicide, but the most well-known issues include debt, compassion fatigue, workplace stress and social media attacks by angry clients. In her TEDx WanChai presentation called “The Partnership That Might Save Your Pet’s Life,” Dr. Cahalane shares some of the factors can propel a veterinary professional into severe depression. And in today’s short episode of Tripawd Talk Radio, she offers helpful tips for us to make sure our own veterinary super heroes never become part of those sad statistics. Don’t Miss Part 1 of our interview with Dr. Cahalane, What Hong Kong Pet Parents Can Teach Us About Dog and Cat Family Members. Intro: Thank you for tuning in to Tripawd Talk Radio where we’re spreading the word that it’s better to hop on three legs than limp on four, hosted by Jim and Rene and Wyatt Ray of the Tripawds Blogs Community at Tripawds.com. Curious talks for canine amputees and their people. Jim: Hello and thank you for listening. This is Tripawd Talk Radio . And today is November 26, 2018. We have a very special guest with us today here to discuss something very important to all pet parents and really anyone working in the veterinary industry. Dr. Alane Kosanovich Cahalane is the first board-certified specialist in small animal surgery to practice in Hong Kong at Veterinary Specialty Hospital of Hong Kong. She is also an avid advocate for the Not One More Vet campaign. This movement is building public awareness about the alarming suicide rate within the veterinary profession. Dr. Cahalane will help us understand why nearly one in six veterinarians consider suicide at least once in their careers and how we as pet parents can help. We will also discuss the important role social media plays in veterinary care. This is important. So let’s get started. Thank you for joining us again, Dr. Cahalane. Dr. Cahalane: Thank you for having me. I’m happy to be here. René: And we’re happy to have you here because after seeing your TED talk called the Partnership That Might Save Your Pet’s Life, I was blown away and said we need to discuss this with our audience because so many of us have such close relationship with veterinarians because of the amputation process. It’s a huge one. So Dr. Cahalane, thank you for being here. Let’s jump right in because we only have 15 minutes and I want to get going. Tell us what is the Not One More Vet campaign about? Dr. Cahalane: Well, I have to say that I am not responsible for its conception at all. There are some great veterinarians doing a lot more work with the campaign than I am. But really what it focuses on, it focuses our profession on our colleagues who are suffering from anxiety and depression and even those who have taken their own lives or have considered taking their own lives because things get so low. And so the campaign is about raising awareness, having a group of people that can share in their experiences and feelings about this profession and trying to keep people engaged and up and let them know that everything is OK and that taking your life is obviously never ever the answer. So it’s trying to raise awareness and trying to give us a platform to discuss these problems that our profession is having. René: Thank you for explaining that. One of the ways that you brought it to our attention was of course the TED Talk. Can you give us a little back story on that and what led you to doing the talk? Dr. Cahalane: I can. It was – the TEDx talk came to me a lot for the work that I’ve done with moon bears in Asia. I had one experience with a moon bear that had a fractured humerus and I would not get into that but that bear really changed my life in a lot of ways. It brought attention to what veterinarians can do in certain situations, and that brings with it a lot of certain popularity and almost you feel like a celebrity sometimes. You feel like a superhero that you’re able to fix something like a moon bear that matters to the whole world. We fix a lot of pets that matter to that family but when you’re talking about a threatened species and a rescued bear, it matters to the whole world. And so, there was really kind of a spotlight brought to me. I was fortunate enough to be in that situation. So when I was asked to a TEDx talk, they wanted me to speak about my experience with the bear or being a woman in orthopedics, a woman in STEM. There were lots of ideas that TEDx people had for me. And so, I started to put ideas together and nothing felt like what I really had to say I guess. I didn’t feel that – I’m not primarily a bear surgeon. And yes, I’m a woman in orthopedics but that doesn’t necessarily define me. And at that time that I was putting the talk together, I could feel myself struggling with one day being in the spotlight and feeling like a superhero and the next day feeling really down because of something that I had read online about myself or a colleague or a client making me feel like I wasn’t enough, myself making me feel like I wasn’t enough. And so as the TEDx talk kind of unfolded, I focused a lot more on that side of things, the human side of my profession rather than the superhuman side. René: I can definitely say that as pet parents see veterinarians like you like as superstars really. I mean I totally agree with that, that feeling that you get because I mean you do. You do wonderful things and you save so many animals and you give our pets a great quality of life. And I mean wow! What you do, is just blows my mind. And so when I saw your TED talk and I saw that it was leading towards this awareness that what pet parents say about their veterinarian on the internet can have such a huge impact on the vet’s mental health. It kind of – it just blew me away. And I’d like to ask you, what do we pet parents do to create stress in the veterinary workplace? What are some of the things you see on an everyday basis that make your life a lot harder than it needs to be? Dr. Cahalane: Yeah. I mean I think a lot of it – the problem isn’t just about clients. We as veterinarians, also have to sort of admit that we are perfectionist. We want – we came into this profession to fix animals, to fix them. We want to take the broken and make them fixed. We want to take the sick animals and make them better. And that’s just not always possible in medicine. Medicine is of course unpredictable. We run businesses. And so, we have to consider that there are financial aspects to what we do and so we’re not always able financially to fix the things that are broken. And so, that in and of itself brings a high level of stress and anxiety to our profession because always ever wanted to do since we were little kids is fix pets. And when you realized that it’s not always success story after success story, it can start to wear you down. And so, we find ourselves in situations where we’re constantly trying to explain that we do have expertise and that we are real doctors and that we do know what we’re doing. And that’s exhausting. It is exhausting to try to explain to someone that you really have the training and the expertise to do what you’re here to do. René: Oh, I can only imagine that it’s much different being a vet today than before, Dr. Google came out. And I think there is fine line between being an advocate for animal and asking good questions versus giving our vets the impression that we don’t trust them. So how do we help our vets be the best they can be for our pets when they’re in a bad health situation or something that you’re trying to manage? What are things that we can say and do to help you? Dr. Cahalane: That’s a great – the greatest question ever. One thing that comes to mind is a study that was done in a Neonatal Intensive Care Unit for human babies. And they took two groups of people who pretended to be parents. And one group were very positive and they spoke to the doctors and the nurses with kindness and patience and/or even just neutral discussion. And the other group of parents spoke to their doctors and nurses with negativity whether it was rudeness or anger or questioning things in a way that was unkind. And what they found was the teams that were subjected to the positive parenting group worked more efficiently, they made smarter medical decisions, even though it was a study setting, they would have in theory been able to save more babies just because they were exposed to kindness or neutrality rather than negativity. And so my biggest piece of advice to clients is you don’t have to blindly trust in us. We’re not asking for that kind of faith. But to be patient and to be kind and ask questions. Ask lots of questions but ask them in a way that is respectful. And I promise you that we will answer them and that we will communicate if we can build that rapport and that sort of loyalty with our clients. But the clients have to be present and be part of that relationship building as well and not just go into it with a lack of trust or go into it with impatience or just a lack of kindness. Does that make sense? René: It does. Thank you. It’s – I can see that it would be difficult for people to remember this in a very traumatic situation, an accident or some unexpected situation that they’re dealing with. So I would love to help get the word out on that. Can I get a link to that study? So we will do that. Dr. Cahalane: Oh yes, I will. I will have to look for it. It was one of the things that I wanted to talk about in my TEDx talk. In 12 minutes, you have a very short amount of time so I didn’t. But I’m speaking in the United States in May I think and I have a whole hour to a lot of veterinarians so my hope to be able to include a lot more of this stuff. But I will definitely send you that link. René: Thank you. Thank you. We would love to have that. And I’m just curious. Based on your practice in the US versus in Hong Kong, do you think that the Hong Kong pet parents are more willing to go into a situation with kindness and patience versus in the US? Dr. Cahalane: Oh, that’s a good question. So in our last 15 minutes, our previous little chat, I talked about how passionate these people are about their pets, that people in Hong Kong view their pets as family members. And I think as a result, their expectations are even higher. And Hong Kong is a very competitive and demanding culture as this big metropolitan city. Imagine again that it’s like New York City. So there are not a lot of patients floating around. And that’s where the CE [0:12:52] [Phonetic]. Not a lot of patients. Not a lot of – inherent kindness isn’t necessarily the default in a very busy city. And so I think that one of the things I would love to bring here is just that relationship building that I did feel a little bit – it was a little bit easier when I worked in the States, that trust and that rapport that just comes in when you first shake someone’s hand. I’m trying to build that here. But I think it’s a little more challenging because of the demands of this culture. It’s also a very social-media-driven culture. And if you make a mistake, you will find yourself on social media, and that’s another thing that I’m really trying to bring awareness to. René: Yeah. The whole social media thing is – I mean like you were saying in your TED talk, it can destroy somebody. So I just encourage people, instead of posting to social media that you’re frustrated about a situation, how about talking to your veterinarian first or if you’re not comfortable with that, the practice manager. But any other tips you have in a situation gone bad and somebody wants to let some steam out? What can they do? What would you advise? Dr. Cahalane: Yeah, absolutely. I think that if you’re not happy speaking to even a practice manager, speak – go higher. And I can tell you a practice owner that this practice is my heart and soul and blood and sweat and tears and I want every client who comes in here to leave with a feeling of confidence and security that they have the best care that could have here. And if you’re missing that then talk to me. And I know what practice owners, we’re very busy but our practices matter to us and our patients matter to us. So go to the top if you have to, if you really want to talk to someone. But going to social media just isn’t going to get you anywhere. And I think it’s important for pet parents to realize that you’re also creating sort of a reputation for yourself on social media. And we as veterinarians can become wary of clients who are very vocal on social media. That is a tough relationship to build from the start when we know you’re kind of already out there with a lot of negativity. So just be aware. It’s like talking to a teenager who first goes on to Facebook. You have to be aware that everything you put out there is viewed by potentially the world. And so make – try to be positive. Try to always have a positive impact out there. René: I love it. And with that, we are going to end this discussion for now. But thank you so much for all of this great information, Dr. Cahalane, and keep up the great work. Dr. Cahalane: Thank you so much, Rene. I wish we had four more sessions. I could talk forever. But you’re the greatest. I really appreciate your support on all of this and you’re giving veterinarians so much hope. And thank you also to both of you for the big time difference that we’re going through right now. I know it’s nighttime for you guys. So I appreciate you being flexible with the Hong Kong time. Jim: Oh, that’s quite all right, Dr. Cahalane. And thank you so much for you and everyone behind this are doing and for sharing it with our audience. Learn more about this important campaign on social media and help spread the word with the #NotOneMoreVet. And visit NOMV.org to see how you can help provide veterinarians with the support they need. Until next time, pet parents facing amputation for their cats and dogs can find support and many free resources at Tripawds.com. Outro: Until next time on Tripawd Talk Radio . Learn more about canine amputation recovery and find the best gear for three legged dogs at Tripawds.com. Another informative interview driven by great questions! Quite disturbing to hear about the high suicide rate among Veterinarians. An aside, just curious, do you have any idea the ratio of female Veterinarians to male Veterinarians? And as you mentioned, I’m sure “Dr Google ” can certainly make a customer be a bit of a challenge sometimes aa rhey appear to second guess anything a Vet says. With everything a Vet has to deal with, that has to take a toll on a Vet day in and day out. And to ramble a bit more…..would love to know, from her perspective, a constructive way to get proper pain management for a dog after amputation surgery when the Surgeon doesn’t provide it. From what I’ve seen on the site, it’s not that prevalent, but it happens. One member was just given the equivalent of Metacam and, when it was clear the dog was in pain, was told by the Vet the dog didn’t need anything else and she didn’t advocate strongly for it, because she “trusted” him. Thank you again. This is so interesting. So happy you found it informative! I had a statistic for you and now I can’t find it. But this article backs it up; women make up the majority of younger vets now. For sure. I mean what vet doesn’t want a client who does their research, that’s a good thing. But it’s a fine line between being educated and advocating, versus second guessing everything about treatment. As pet parents we owe it to our vets to discuss what we’ve found, not turn it into accusations that they are doing the wrong thing. It’s a learning curve. would love to know, from her perspective, a constructive way to get proper pain management for a dog after amputation surgery when the Surgeon doesn’t provide it. Step 1: Know the pain indicators in dogs and pain indicators in cats. Step 2: Take good notes about why you believe your animal is in pain. What is their behavior like? When does it happen? Have those notes ready when you approach the vet. Step 3: Call the clinic and let them know you believe your animal’s pain management needs adjusting. Tell them you are ready to discuss with the vet or nurse today. Step 4: If you don’t get the results you want, call and ask to speak to the practice manager. Let them know you really don’t want to uproot your animal from their post-op care, but you will find a clinic that practices more proactive pain management if they don’t respond to your request. I also want to encourage people to be firm, but understand that veterinary clinics are also especially cautious when it comes to dispensing pain medication, thanks to the opioid abuse happening in human medicine. Many clinics have had clients who abuse vet-prescribed pain medications at the cost of their own animal’s comfort. It’s an awful situation, so it helps to be mindful of this when advocating for better pain control. We’ve talked about post-op and amputee with vet pain management expert Dr. Petty, and here’s what he suggests for more long term pain management . Hope I’ve answered your questions. Let me know! Really appreciate your thorough response!! It was a great follow-up “enhancement ” to your interview with Dr Cahalane. The step by step simple approach for advocating for pain meds is such a good guideline. Using the non-threatening word to “discuss” the information we’ve found is not alienating in any way. Yes, very helpful indeed! Thank you! Aww glad to hear it Sally, thank you! I need to turn that into a blog post. You always have such great ideas.